Stretching in southeast direction, mount Rumija with its highest peak Rumija (1594 meter) is the southest mountain of Montenegro. As a Dinaric natural barrier, Rumija separate Adriatic Sea from the Skadarsko Jezero lake. With the height of 1594 m, it drops steep towards the Adriatic coastline and somewhat less steeply towards the southern part of the lake. Rumija is very special and unique mountain with one leg in the Adriatic Sea and the other leg in Skadar Lake. The elevation difference with more than 1500 meter is one of the largest elevation difference in Montenegro, while the path from the Bar old town to the summit is one of the most attractive mountain path in that country. 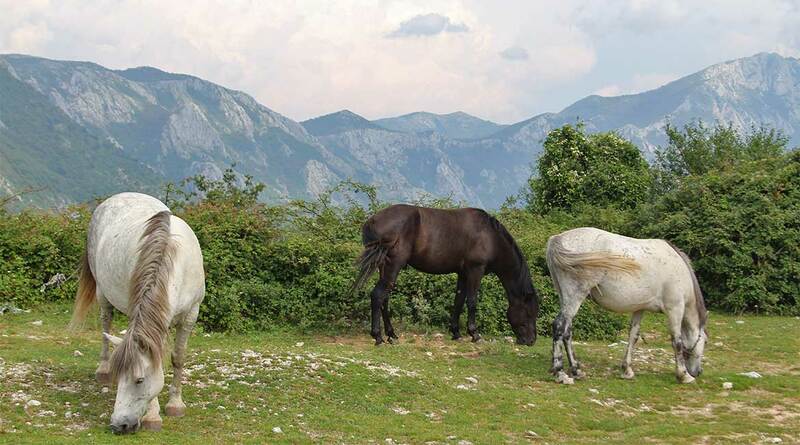 The general aspect of Montenegro is that of a succession of elevated ridges, diversified here and there by a lofty mountain peak, and, in some parts, looking like a sea of immense waves turned into stone. The ridge of the Rumija mountain is more than 10 kilometer long and include Sutorman with its highest peak Široka Strana (1185 meter) and Vrsuta (1183 meter). Between the Bijela Skala pass and Rumija main summit is placed rocky ridge of Čagoglina (1297 meter), while on SE are connected by ridge the peaks of Brisan (1435 meter), Kozjak (1427 meter) and Debelin (1205 meter). On the south from the main summit and Veliki Mikulići is wide and roundly mountain Lisinja with its highest peak Loška (1353 meter) which is nicely visible from the Bar as a first visible peak. On the southern side of the mountain are placed few water springs and that are the three small rivers Železnica, Bunar and Međurječ. Al thought Montenegro is a mountainous country, the destiny of its citizens was to live with them. The thousands of years of the history of Montenegrin people was the reason why they glorify the mountains as a spiritual symbols. Two of them has the special importance for Montenegrin people, defending Montenegro and its people like some natural fortress. That are Rumija and Lovćen. During the Montenegro history, Rumija mountain was the first mountain with a strong spiritual influence, while after the 15th century the mount Lovćen became a leading spiritual simbol of Montenegrins. The proof of the Mt Rumija’s holiness in the last thousand years is a famous cross of St. Vladimir named as „Krst Svetog Vladimira“ or „Vladimirov Krst“. As a ruler of Duklja’s Montenegro, Vladimir was executed in 1215. when he came out from the church of the Sveti Ahilije in Prespa. After the execution of Vladimir, the spiritual ceremony of wearing of St Vladimir’s cross to the summit of mount Rumija became a famous spiritual ceremony in which participate the Orthodox Christians, Catholics and Muslims. Vladimir was the first saint of Montenegro. Each year on the Holy Trinity Day the spiritual devotees wear that cross to the summit of mount Rumija where is placed small Orthodox Christian chapel. The goal of the ceremony is to wear the cross to the summit of Rumija before the sunrise. When the sunrise come, the Orthodox priest bless the cross and rotate to all four sides of the World. On the summit of Rumija spiritual devotee make a spiritual prayer „Krst se nosi, Bog se moli, Gospode pomiluj!“ (The cross is wearing, Pray to God, God bless us!). Also, believers wear rocks and stones to the summit because of theirs desire to build one day a church on the summit. After the priest blessed the people and after theirs finished prayers, the believers descending from the Rumija and on the plateau below it continued to celebrate with singing, dancing, eating and drinking. That spiritual procession is some kind of imitations of the Jesus Christ’s walk with a cross to the Golgota hill. Rumija is a very special mountain because of its outstanding summit views and panoramas. From its summit you can admire the endless view above the Adriatic Sea, while on the other side you can enjoy in impressive scenery and beauty of the large Skadarsko Jezero lake and many hilly islands on it. The highest and most impressive peak which you can see from Rumija’s summit is the highest peak of Prokletije range Maja Jezerce (2694 meter), placed in the Albanian part of Prokletije massif. The Rumija mountains with its location between the Skadarsko Jezero lake and the Adriatic Sea are often overlooked as range because the attention goes largely to the higher North. Therefore there is almost no accommodation to be found in the mountains. Most accommodation in the area can be found in Bar, which lies at the foothills of the range. A smaller number of accommodation can be found on the shores of the Skadar lake on the opposite of the mountain range. Zubci mountain apartment – Zubci mountain apartment offers free Wi-Fi and guests can enjoy barbecue facilities, a garden and a terrace. All air-conditioned units include a kitchen with a dishwasher, oven and dining area. Each accommodation has a terrace with views of the mountains. The apartment has an outdoor pool. Bike rental is available at this property and hiking is possible nearby. Facilities : Terrace, Garden, BBQ Facilities, Swimming pool, Free Wi-Fi Internet Access Included, Free Parking, Car Hire, Bicycle Rental (surcharge), Airport Shuttle (surcharge), Pets Allowed.